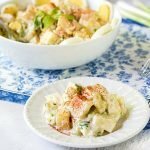 Summer is all about potato salad for me, so I came up with this low carb potato-less salad using celeriac or rutabaga. You will love how good of a potato substitute these vegetables are! Peel and cube the celery root or rutabaga. Cook in the microwave for 4-8 minutes and fork tender. Let cool while preparing the rest of the salad. In a small bow mix the mayonnaise, vinegar, sweetener, salt, pepper and mustard. In a larg bowl add the celery root or rutabaga along with the green onions, celery and 1 egg chopped. Add in the dressing and mix well. Garnish with the remaining egg.